Pay averages $15/hr. with the potential of $20 or more, the company says. Applicants should have at least 15 hours per week available to work. These are independent contractor positions and don’t come with employee benefits. If you’d like a job with benefits, just search with the word “benefits” (without quotes) in the field on the lower right of our pages. “We have a huge opportunity in Inbound Sales at NexRep. Be an independent contractor from the comfort of your own home while bringing in between $15 – $20 hourly! Being an agent for this program is really fun! You get to be an extension of that fun and excitement as you place the order for the customer. Earn up to $15/hour or even more! It’s like you are going on a trip to the mall together, where you introduce additional items that complement their original purchase. These are typically happy, fun customers: after all, they are shopping! Our most successful agents have high energy and give the customer a fun experience – and the good news is that our top agents are invoicing $15 – $20 an hour! 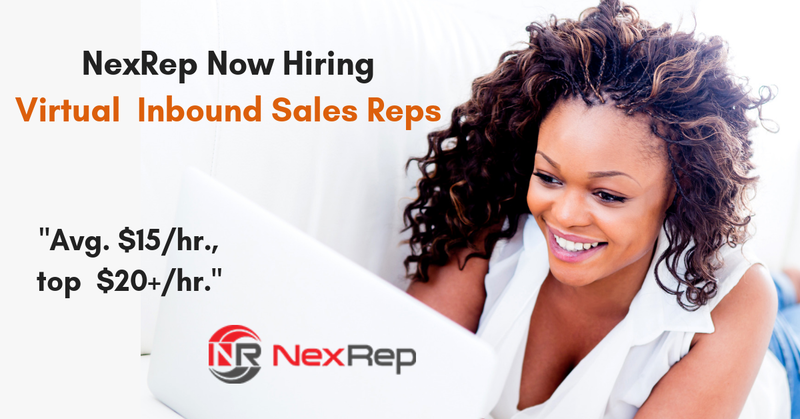 If you’d like to earn extra money helping people shop and have fun, come join us at NexRep with Inbound Sales! Click here for more details and to apply. For more jobs like these, check our Newest Jobs & Gigs page. To be the first to hear about jobs like these, like our Facebook page. Good luck in your next steps toward working from home!